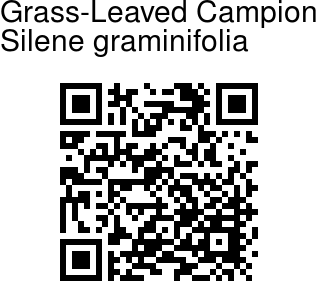 Grass-Leaved Campion is a perennial herb, 15-50 cm tall. Roots are robust, multicrowned. Stems are clustered, erect, slender, simple, hairless or velvety at base, sticky towards the top. Basal leaves are numerous, linear-inverted-lanceshaped, thin, 2-8 cm long, 2-4.5 mm wide, ciliate, base narrowed into short stalk, tip pointed. Stem leaves are 2 or 3 pairs, stalkless, ciliate, base slightly fused, clasping. 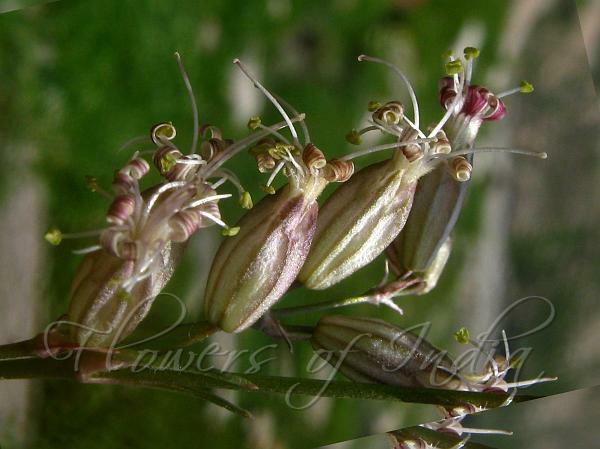 Flowers are borne in a raceme-like thyrse. Cymules are opposite, with a solitary flower; peduncles very short. Flower-stalk is shorter than or nearly as long as calyx, slender, hairless. Bracts are ovate-lanceolate, margin membranous, ciliate. Calyx is narrowly bell-shaped, 7-10 x 2-3 mm, hairless. Androgynophore 2-3 mm, glabrous. Petal claws narrowly oblanceolate, long ciliate, limbs protruding beyond calyx, white, deeply divided into two, up to middle. Lobes are linear, tip blunt, coronal scales minute. Stamens and styles	protrude out. Styles are 3. Capsule is ovoid, 7-8 mm. Seeds are dark brown, kidney-shaped. about 1 mm. Flowering: June-Jully. Photographed in Koksar, Lahaul, Himachal Pradesh.